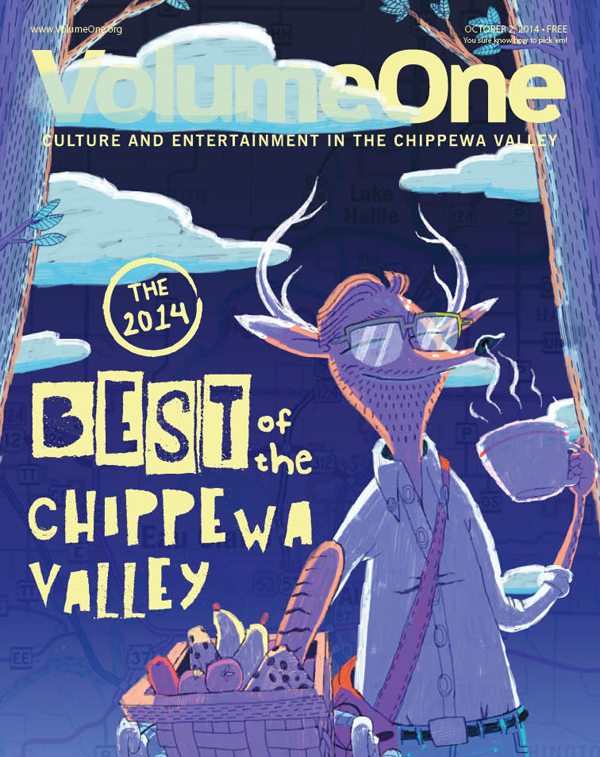 For the last eight years, we’ve turned to our readers – you guys – to chime in and speak up about your favorite places to eat, favorite bands in the area, favorite secret spots, favorite dishes at favorite restaurants in our Best of the Chippewa Valley Reader Poll 2014 (or BOTCVRP2K14, if you like abbreviations). And every year you guys show up. I mean you really show up. To give you an idea what that looks like, 3,040 of you voted, casting 83,567 votes (compared to last year’s 66,445 — a 26 percent increase) on 178 categories. That’s a lot! Especially if you know how numbers work! And this thing keeps getting bigger and bigger: the print issue showcasing this year's results is the single largest issue of Volume One ever printed. However, in those 88 pages (88 pages! ), we’ve eschewed the bulk of our regular editorial content, covering all the latest events, music, books, art, eats, and Chippewa Valley happenings (don’t worry – it’ll all be back in two weeks!) in order to get the poll results out there in print. To us, this poll is an incredible thing; and that’s not to pat ourselves on the back. It’s you guys. It’s you all getting into it and voicing your opinions about the place you live. If you think something’s great, this poll celebrates how great that thing is. If you wish something were better, this poll shines a light on that thing and gets us all thinking of ways to make it better. Because really, the best burger joints or the best parks aren't going to be the reason this is a great place to live. It's the people here who populate those places and try new things and genuinely care about making their home great. After all, this is your home. Your neighbors are your neighbors. There's something kinda beautiful in that. That’s the goal here: To make the Chippewa Valley a better place to live through the voices and votes of those who live here. Because really, the best burger joints or the best parks aren’t going to be the reason this is a great place to live. It’s the people here who populate those places and try new things and genuinely care about making their home great. After all, this is your home. Your neighbors are your neighbors. It’s up to both of you – not one or the other – to make this place great. There’s something kinda beautiful in that. So to the 3,000+ voters, thank you for letting us and your community know what you think. Because really what’s the use of having a best burger without anyone special to eat it? As you peruse these results, keep in mind ways to take advantage of them. If you see a great thing you haven’t tried, go try it! If something you disagree with disappoints you, let people know! We should all be striving to celebrate the things we have, and work on the things we don’t. That’s how places and people grow in harmony together. This is big deal to us and we believe to this community. It starts with being active and engaged, trying things, going places, interacting with both your neighbors and your community. So without further ado, here are the best of best. Year in and year out, Chippewa Valley voters rank these winners as the cream of the crop in our poll. Here are the people, places, and things that have won their categories five or more straight years!